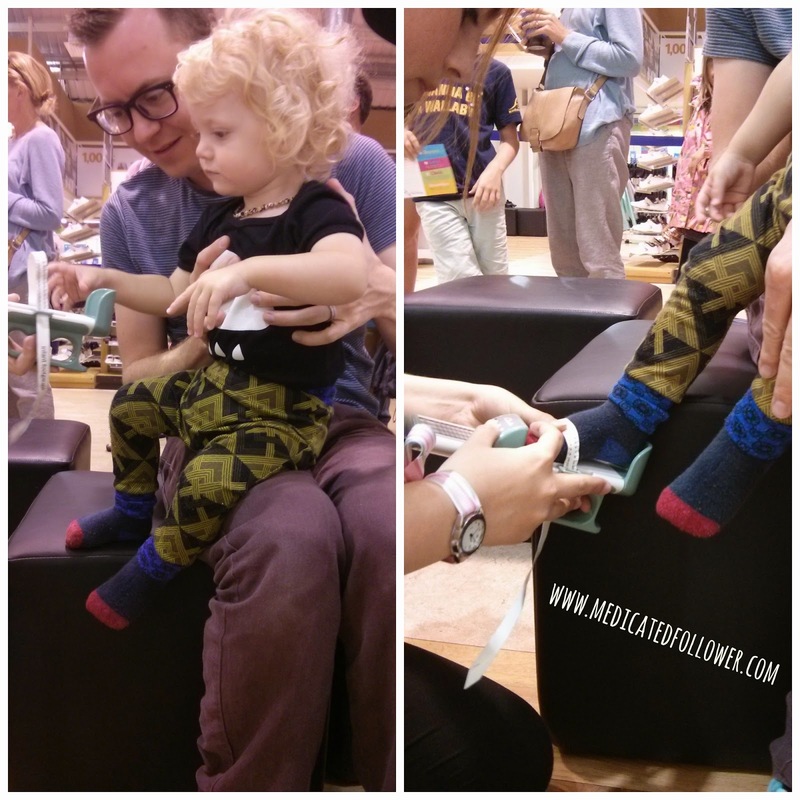 This week for Trendy Thursday I'm going to share with you our Clarks "First Shoes" experience. I was recently contacted on behalf of Clarks and asked if either of my boys would like to try some shoes from their range. We decided that as Felix hadn't been measured it would a be a great opportunity. We ended up combining the first shoe purchase along with a long planned trip to Clarks Village. We are lucky to live fairly close to it and usually visit at least once a year. I find it a good place to get measuring done and the outlet shop is good for school shoes! Let's get our feet measured! Both boys got measured. I wanted to check that Ethan's feet would be OK for the school shoes he already had. It seemed to me that they hadn't grown at all in the last year and this proved to be the case (crazy - how can his feet not have grown?!). At least he can stay in the same school shoes for a while longer. This is proof of the quality of the shoes, he's worn them for a whole school year and they are still going strong! Felix took to the measuring experience very well. These days they have fancy measuring machines that you stand on and ipads to help the shop assistance measure - very clever stuff!! As Felix was unlikely to stand still for them, they used a hand held more traditional measuring device which was just fine. As it was something new to him he was calm and didn't try to fight the shop assistant off - thankfully! After we'd got the boys measured (Ethan was still a 9F and Felix came in at a 5G) we went to have a look around to see if there was anything that took our fancy. We were in the large outlet shop so I was quite hopeful. Nothing jumped out at me though. My only real criticism with Clarks is the choice for boys. It seems to me there is quite a lot to choose from online (though still far less than for girls) but in the actual shop, there were really only about 3 different styles in Felix's size. Even in larger sizes the choice was out of maybe 4, perhaps 5 styles. And they were all brown or blue.. perhaps a bit of khaki green and of course black for school shoes. Feeling a little disappointed we left the shop. All was not lost though, because a full price shop was also on site just around the corner. As soon as we stepped in the door I was a little more hopeful. Although the selection was still small there were quite a few styles that hadn't been in the other shop. There were some quite funky looking trainers and some cool smart looking shoes that stood out with day-glow laces. They really grabbed my attention and a lovely looking grey pair with green day-glow laces were on the shelf in Felix's size. I asked a shop assistant if we could try them. The answer was yes, of course, but we were also offered what Clarks call the "First Shoes Experience". We thought this would be fun, so of course, we said yes! 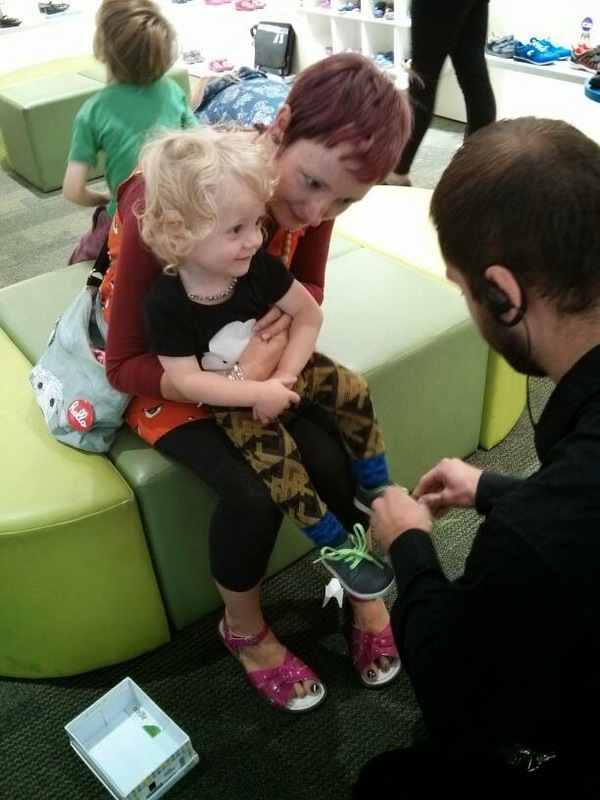 The First Shoes Experience is basically the same as a normal children's shoe fitting but you get a photograph taken, a little leaflet telling you all about how children's feet grow and a record card on which you record your child's foot size each time they get measured. The sales assistant servicing us was lovely, very attentive. I felt we received great one to one attention and I had confidence that the shoes were being fitted correctly. Especially because they ask another member of staff to check the fitting of the shoes. Very reassuring. 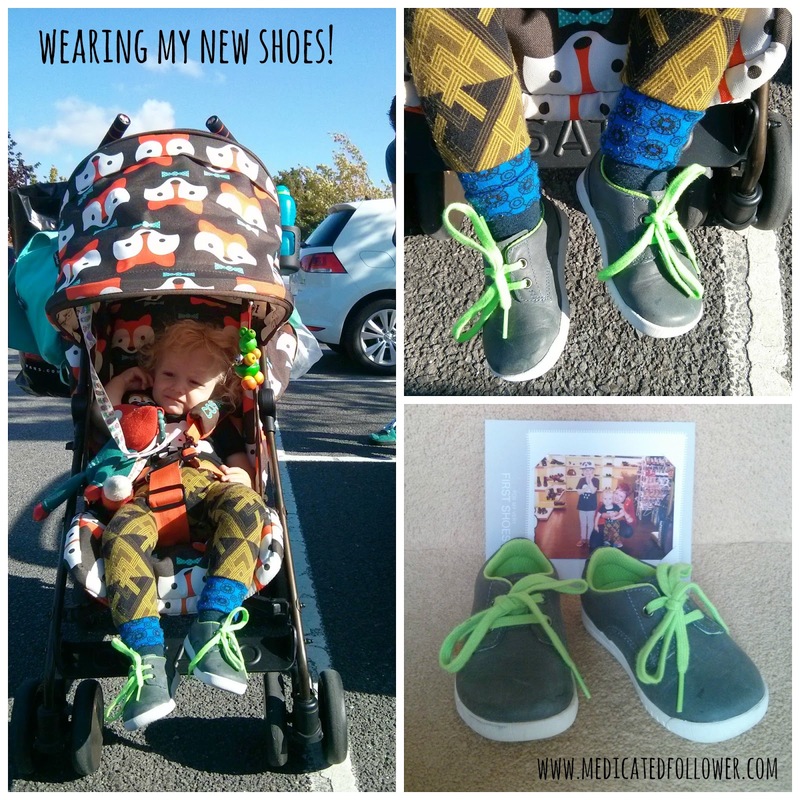 The shoes fitted Felix perfectly and he was soon tearing around the shop causing mayhem in his new kicks. He even attempted to shop lift them by running out of the shop several times. The looked adorable on him so we were very happy to take them. Since then Felix has worn the shoes on many occasions. They appear to be very comfortable for him, he hasn't experienced any rubbing on his feet or toes. He walks very well in them. They aren't big and clompy, he can run about in them freely. I'm always happy to recommend Clarks. I do love their quality and service. I wish they'd broaden their stock for boys and I wish their girls section wasn't so pink, it does seem a little dated to me. There are some gorgeous unisex styles that I think they could be stocking. I'm sure something a little retro would go down a treat. Overall though, I feel confident when I buy from Clarks. I know my child's' feet will be well looked after. 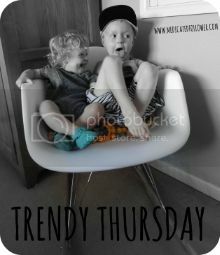 As it's #TrendyThursday if you've written a children's fashion post lately you can link it up below! Please don't forget to comment here and visit others who join in. I will tweet your link at least once, more if I can! Please link back to my blog in your post and/or display my badge (available to the side). Thanks! I was trawling the internet last night, as I often do, when I stumbled across something that really caught my eye. Rock Your Kicks. 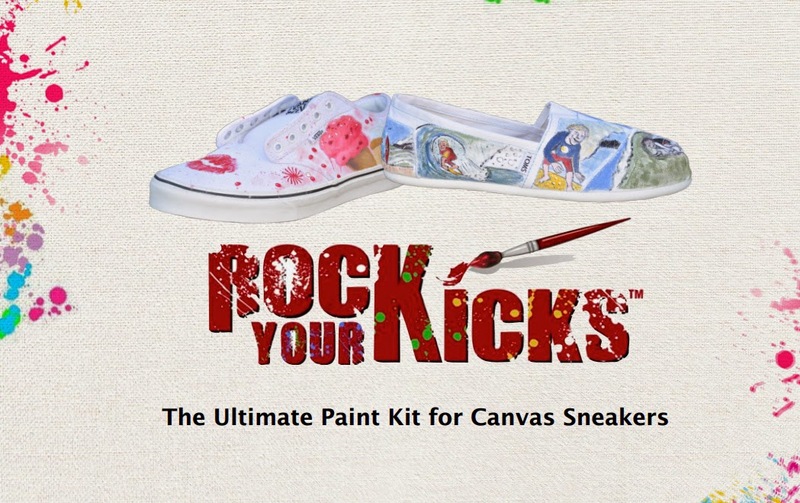 What is Rock Your Kicks, you're mumbling under your breath.. Well, to quote the makers, it is "the ultimate paint kit for canvas sneakers" (or trainers/pumps to us British folk!). Individual eye-catching footwear is really where it's at just now. I've been into making my shoes individual for as long as I can remember.. back in the day I'd paint my DMs with Tip-ex and thread beads onto the laces. These days it's adding bright laces to converse and a pair of Shwings. Ethan loves all of his funky shoes. I love mine. We'd love to take it to the next level, I know it! So, what do you get in a kit? "Encourage creative expression in all kids, young and old and to inspire art, laughter and joy worldwide." There is another reason I'm writing about Rock Your Kicks today. They are using Kickstarter to help get themselves launched and they have only 4 days left to reach their $10,000 goal. This is where you lovely lot come in. If this is something you think you and your children would love, perhaps you'd like to get involved? You can pledge as little as $1. If you pledge more you will get a little something back. For example, if you pledge $15 you will receive a special backpack. 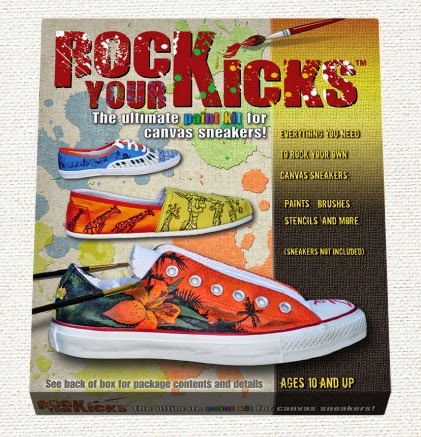 If you pledge $34 you will receive a Rock Your Kicks pack. The more you pledge, the more you get. And the more you'll be helping them out! Something else worth knowing is that Rock Your Kicks will be donating 5% of their net proceeds to charity in the forms of cash and product. I do like a company who give back! 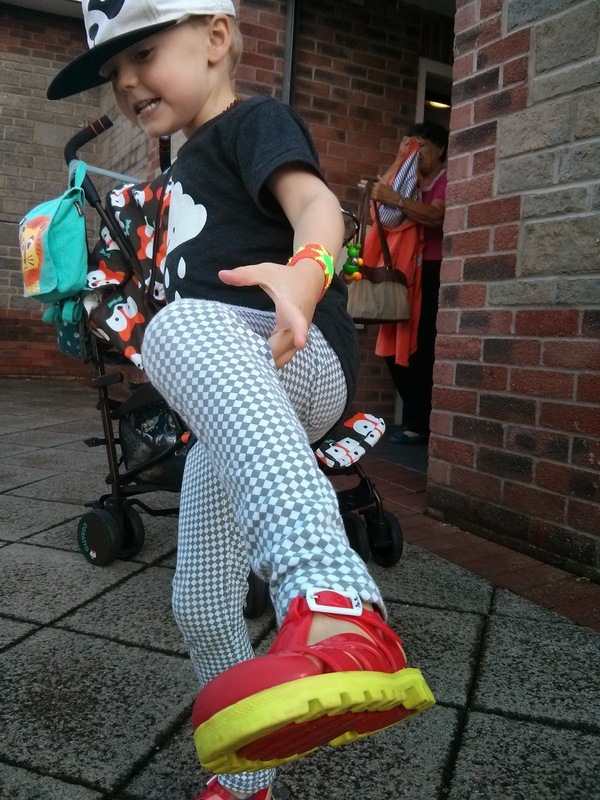 You can find out all about Rock Your Kicks and donate here. The week that knocked us out.. It started 8 days ago. I was walking back to our house after a stroll at the seafront with the boys. Felix was in his xplory, facing me. We were about 15 seconds from our house when all of a sudden, Felix projectile vomited EVERYWHERE. It just kept pumping out of him. It was awful! The buggy was covered, I was covered. On getting him out of the buggy, the poor thing just kept spewing and more and more places were getting covered.... He spent the next two hours being sick every 10 minutes or so. After that it was just dry heaving. Poor child. 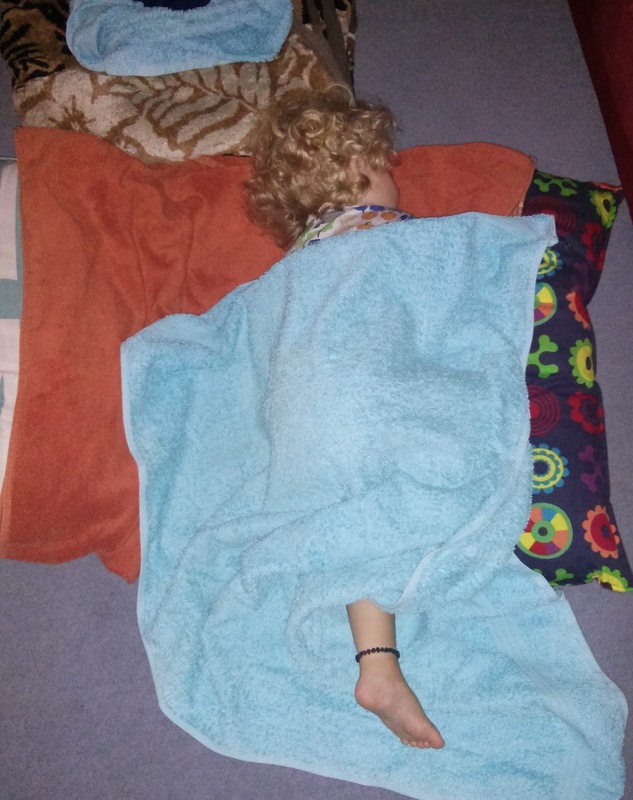 Pete and I kept watch over him all evening (he slept on the living room floor on top of and covered with towels) and we had him in our bed over night. Luckily, the vomiting stopped. Pete was back at work the next day after a lovely two weeks off, so the boys and I had a quiet day at home. Although Felix seemed quite well and had stopped vomiting, I didn't want to risk spreading anything around, so we stayed in. Things were going quite well until the evening. His temperature crept up and then the diarrhea started. The poor sausage was having terrible nappy explosions. This continued the next day, he was having the squits every hour or two. By Wednesday morning the frequency had considerably slowed down. He seemed quite perky and his temp was down. I, however, woke feeling pretty rough- I hadn't slept well and had had a few cheeky glasses of wine the night before. I put it down to lack of sleep and a hangover. Wednesday was the one day of the week we'd made plans for. I had bought tickets to take Ethan to see What The Ladybird Heard at The Colston Hall and I was determined we were going despite my "hangover". We made it and we did enjoy it and afterwards, we visited a cafe for lunch. Whilst there, unfortunately, Felix had the most awful diarrhea explosion. It filled his nappy to bursting point and spilled out, running down his legs onto the highchair and dripping onto the floor. It was hole in the ground please swallow me up embarrassing. The poor kid couldn't help it of course. I'd assumed it had cleared up. It took an age to get him and the cafe floor/highchair all cleaned up..
We took ourselves back home. All the while, I was feeling worse and worse. A feeling of nausea was becoming undeniable. I had a weird cough that I'd put down to a reaction to the wine I'd drunk the night before (wine often makes me wheeze) but it wasn't easing. It was all just getting worse. Shortly after we got back home, Ethan called out to me "Mama, I feel a bit funny. My tummy hurts". Oh God, I thought. Him as well! Up until this point we'd hoped that Felix had been struck down with food poisoning. He puts all sorts of rubbish in his mouth before anyone can stop him. I'd assumed he'd eaten something that hadn't agreed with him.. but if I was feeling ill, and Ethan was feeling ill... well.. time would tell! Time would tell indeed. Fast forward to the evening. I was feeling pretty dreadful. Stomach cramps, aches and pains, a head ache, the shakes. Ethan was very quiet, lying on the sofa, refusing food. I took a bath with Felix before his bedtime and as we were sat in the bath I heard Ethan charging up the stairs; "I feel....."
Well. You can imagine what happened next. Just like Felix, he spent the next few hours vomiting until there was nothing left. I continued to feel awful as well. I didn't eat anything, had a raging temp and couldn't stop shaking. I took Ethan to bed with me in our bed. Pete slept in Ethan's bed. Every now and then poor Ethan would retch and heave in his sleep spitting up bile. It was a sad state of affairs. I finally stopped feeling sick around 7am after a very restless night of heaving. I never actually brought anything up. Needless to say, Ethan and I still felt pretty terrible. Felix was still having diarrhea although much less frequently. Pete admitted he was starting to feel quite dodgy. Somehow my boys and I muddled through our day stuck at home thanks to hours of Cbeebies. My God do I feel like Crap Mum of The Year after all of the TV we've watched lately.... There really weren't a lot of other options though. We couldn't go anywhere. It was raining. All three of us felt ill. We were no doubt all infectious. I didn't really even feel well enough to read to them. It was a sorry state of affairs..
Friday rolled around and it brought with it another passenger for our merry ride. After struggling through a day at work on Thursday, Pete was definitely not well. He too had the cramps, aches, pains and weird cough. Friday saw all four of us struggling through the day! As I type now, on Monday evening, we are just about starting to feel normal-ish. We all still have this strange cough which is highly annoying. The D&V have gone though, Thank God. I don't think I have ever had to deal with as much sick or washing as I have in the last week. It was a truly crap way to spend one of our last weeks of the holidays. It was like some form of torture, all of us ill, bad weather, not being able to leave the house, even use the garden. 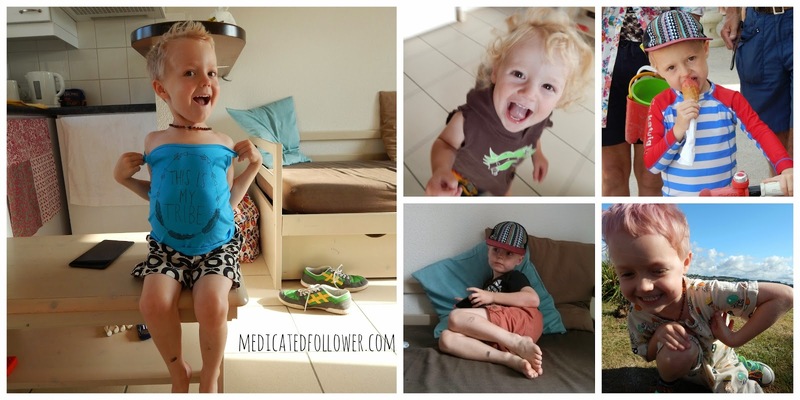 Dealing with ill children when you yourself are ill is bad. Just baaaaaaaaaaaaaaaaad. So that is why, my dear readers, nothing much has been going on here. I'm sure normal service will be resumed soon.. though I must admit I feel little like blogging and more like chilling out and making sure I am over all this illness!!! I will stop moping soon! Trendy Thursday - Holiday Style! We have a wonderful week in Brittany last week. So lucky with the weather, only a little bit of rain. Brittany isn't the south of France, we knew we weren't going to be getting super high temperatures but to be honest, that suits us. The boys were happy. The had the pool and the beach. They spent the week in their swimwear and shorts. Comfy and easy to wear! Now, I have to say that the photo of Ethan above (I'm sure I don't even have to tell you which one!) is probably one of the funniest I've ever taken of him. Poser! 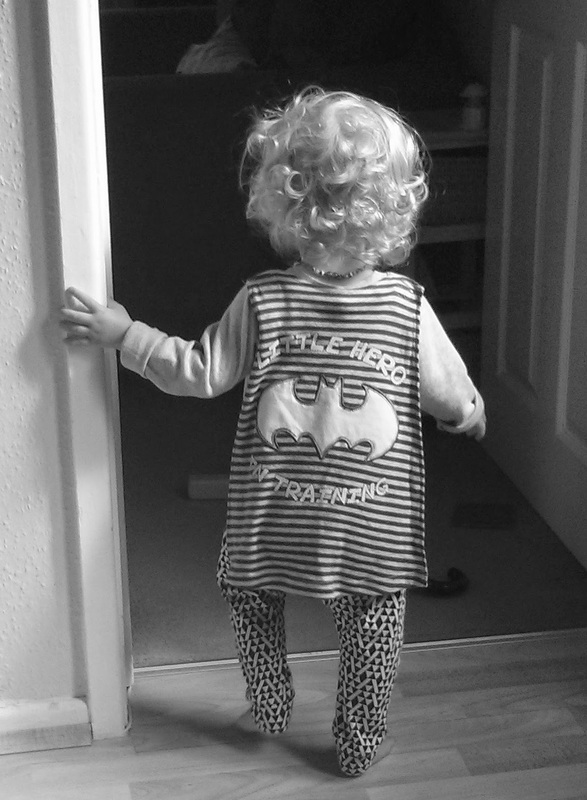 What have your little ones been rocking this week? Link up below to share. I'm sure you know the deal by now. Comment here, share the badge, link back to the blog, comment on others who take part. I will tweet your link at least once, hopefully twice! We are really lucky in Clevedon. We have more than one thing to be proud of, and one of those "things" is our wonderful cinema. 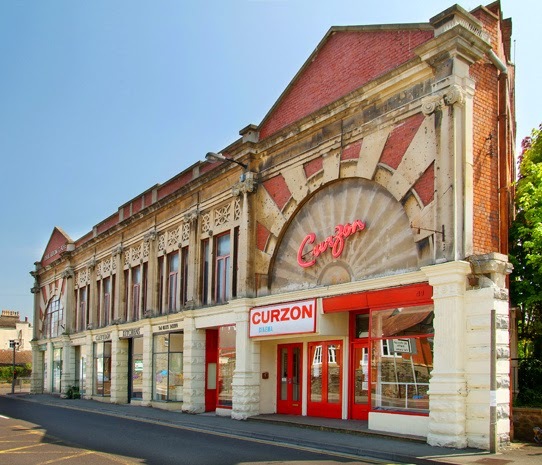 The Curzon (Clevedon) is one of the longest continually running purpose built cinemas IN THE WORLD. 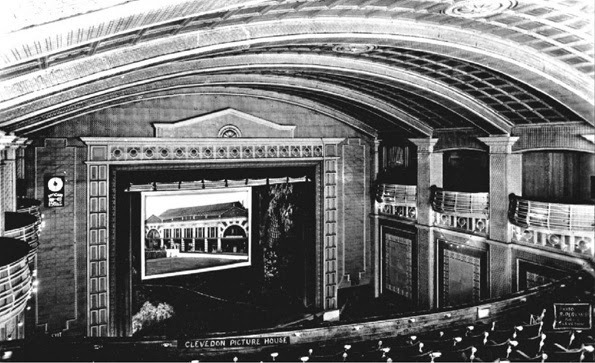 It opened it's doors on the 20th of April 1912. Right in the center of our town, it's a real feature. The front of the building was damaged during the 2nd World War - a soldier was standing in the doorway and was killed by a bomb. The damage is still visible today. I love The Curzon. I don't say that lightly. I really do love it. I visited myself as a child and I enjoy being able to take my boys there. When I have more time, I fully intend to volunteer there. It has struggled for a long time to be profitable so I do love to support it. This is something I've loved over the years - screenings especially for parents/careers held on Wednesday mornings. You can bring your baby along with you. Enioy a current release and no one minds if your baby cries! Even better, CineMa & Baby is improving! From September, it is moving to Mondays at 11am and will include an arts & crafts activities aimed at 0-2 year olds! This will cost £6 per session. Another event I am passionate about! The Kids Club was set up for 3-16 year olds and their parents. Held on Saturdays once a month, for the cost of £4 a ticket you get to watch a film and enjoy an arts & crafts activity after the film. Since having Felix, I have had little time one on one with Ethan. I've found attending the Kids Club at The Curzon invaluable. It provides us with a chance to have some time together, just me and him. 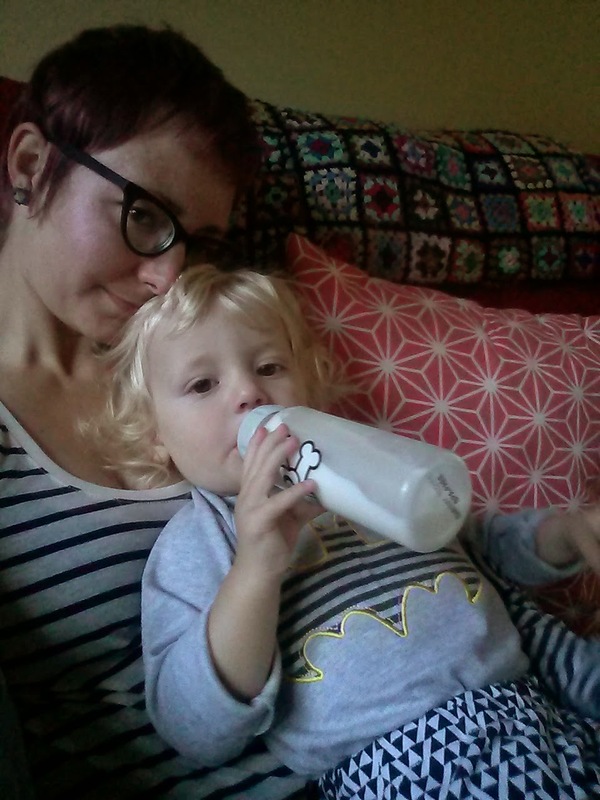 Mummy and Ethan time. It's precious to both of us. Ethan always enjoys the craft sessions after the films. Sometime I really love about it is that it's not all about "new releases". The films shown might be new, the might be classics or they might be something a bit more "cult". To give you an idea, we have seen Dumbo, Kiki's Delivery Service and My Neighbor Totoro among others. The people behind The Kids Club are lovely, friendly, welcoming and very passionate about what they are doing. The main person behind it all is Caroline Lowe. If you go along you are bound to be welcomed by her. I have spoken with Caroline a few times about The Kids Club. She has worked tirelessly to make it a real event. The Kids Club now has a special area above the cinema, a whole room with space for arts & crafts and other actives. It's a great little space and so lovely to see more of the cinema building being used. Over the summer holidays, The Kids Club is running extra craft activities. During August there is a film screening and activity every Saturday morning and during the week extra craft sessions are being held on Monday, Tuesday and Wednesday mornings and afternoons at a cost of £3.50 per session. We haven't been able to attend any of these yet but many of my friends have and they have been raving about them! In short, we just can't get enough of The Curzon. It's such a family and community centered place. A real gem, something that is hard to find these days I feel! Is there something you love in your local area? A shop you love? A fantastic local pool? Whatever it may be, if you have written about it or would like to write about it, why not do so and link up below! Local Limelight is my new linky and it's all about telling others about places you love. It doesn't just have to be where you live, perhaps you've visited somewhere on holiday and would like to tell the world! It's easy to join in - link up below, grab my badge (see side bar), link back to my blog, comment here and comment on others who join in. And spread the word! I've really got into jumpsuits in the last year or so. I actually have quite a few in my wardrobe and I'm starting to think that you really can't have too many! You can have retro jumpsuits, smart "going out" jumpsuits and chillied out hanging our with the kids style jumpsuits. I've just recently become the owner of one that could easily go from day to night though - very handy! Meet my newest jumpsuit from Great Plains. I've been putting it to the test and I can confirm it really is comfy yet stylish. We're about to set off on our holiday soon and I'm very excited about packing this jumpsuit. It's going to be my go-to piece. It'll be great for a day trip or sight seeing. It'll even work down on the beach.. but best of all, if I pop on some heels I'll be able to rock it for an evening out! This is the kind of item you need in your suitcase. Something I do worry about with jumpsuits is how flattering they are. I love how they feel to wear and do like how the look from the front. It's the side and back views I worry about. Ultimately, it's not enough to stop me wearing them, but it is something I think about. On my more "sensitive" days when I feel more cautious about what I'm wearing, I usually avoid them! I love the pattern on this jumpsuit. If you look closely at it, you can see if consists of lots of tiny flowers. From a distance though, it looks like a geometric print. And I am very into geometric at the moment - another reason for me to love it!! I'm guessing that's why it's called Geo Jane! I'm going to have a lot of fun with this number in my wardrobe! 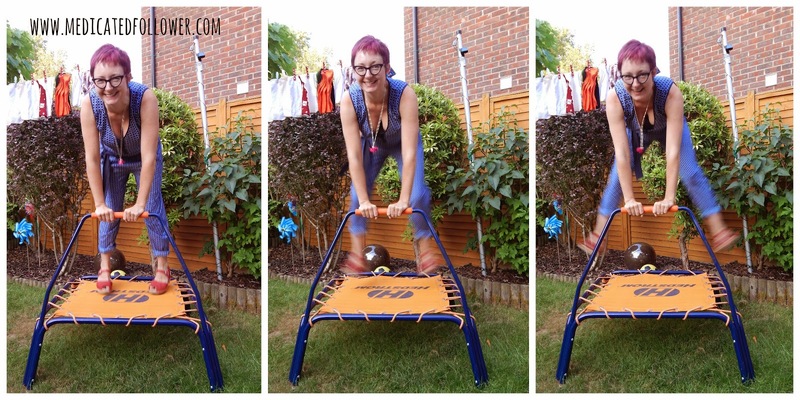 Linking up with Honest Mum for Fashion Friday and Rachel The Hat for Passion For Fashion.